This is the rabbit stew recipe that gives you a second helping from the lapin (rabbit) your family ate yesterday. 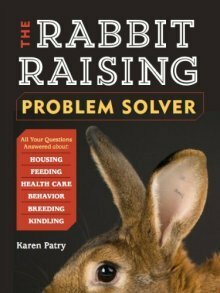 In our home, rabbit stew turns out differently every time, and believe me, we eat quite a bit. Whatever vegetables we have on hand may very well go into the pot. For example, in addition to the veggies suggested below, we’ve added beets, cabbage, and leeks at various times. And each pot of lapin (or lappin - rabbit) stew ends up becoming a hearty meal for the whole family, stretching one rabbit into two meals for a family of four. Below: Who says one must follow a recipe to the 't'? 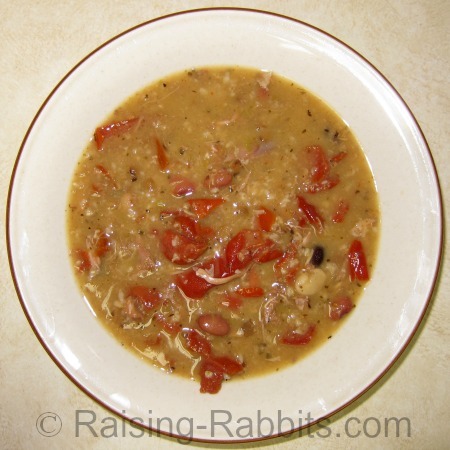 This rabbit stew-du-jour contained only beans, oats, rabbit, sun-dried tangy tomatoes, and spices. It was wonderful! After a meal of fried lapin (rabbit), or after crock-potting a stewer rabbit and using the lapin in another recipe (leave a little meat on the bones), gather up the bones and meat scraps and place all in a dutch oven. Cover with filtered water. Add S&P, garlic, onion, carrots, celery, poultry seasoning, basil and vinegar to the pot. Remove pot from heat, and allow to cool. You can also discard the veggies (my thrifty hub balks at this!) and then re-add various amounts of fresh veggies -- garlic, onion, carrots, celery -- back into the rabbit stew recipe. This will enhance the flavor of the stew as well as add nutrients. Reheat. Taste; adjust seasoning at will. Simmer until the newly added fresh veggies and grain are soft, about 30-40 minutes. When the rabbit stew is just 1-2 minutes from ready, add any assortment of finely chopped herbs and/or cheese to the pot. Or, you can put these items in bowls and place on the table so family and friends can help themselves. You know how meat broth tends to gel in the refrigerator? The reason for this is the presence of glyconutrients -- the immune-system-supercharging ‘alphabet’ whereby your body communicates with each of its parts. This is hugely important for health. If you don’t eat enough glyconutrients, your immune system has to function with some of its ‘phone lines’ down. Important messages may not get through. You may get sick more often and recuperate more slowly.